Counters, tables, end tables, coffee tables, desks, and park tables. Tired of wasting an entire table to place a single little flower vase, or a phone? Illumutations is the answer to your prayers! It's illuminated: each shelf has a built-in light that can be set to "always on", "always off" or "automatic"! 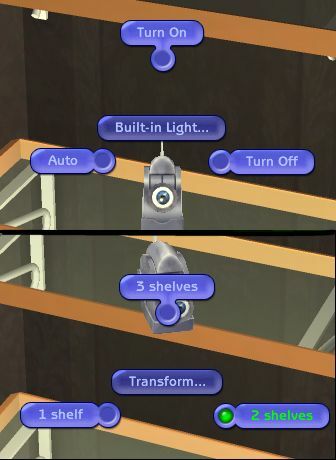 It's a space-saver: each "Illumutations" multishelf can host up to SIX objects! It's usable: the sims can interact with the objects placed on the lowest level! It's realistic: no one lines up perfectly the ornaments on the shelves... Each object placed on the shelves will have its own unique position and orientation! It can be placed everywhere: under a window, over a floor stereo, even over a toilet! The "Illumutations" Multi-shelf works with any game configuration, from the base game to Mansion&Garden (i.e. all existing games). You can find it in the catalog under "Surfaces / Misc" (available for Community lots, too). The Multi-shelf can host only small objects that are supposed to be placed on surfaces: objects (even if small) that are supposed to go only on the ground can't be placed on this shelf. For instance, you can place on it craftable flowers, but not a toy xylophone. 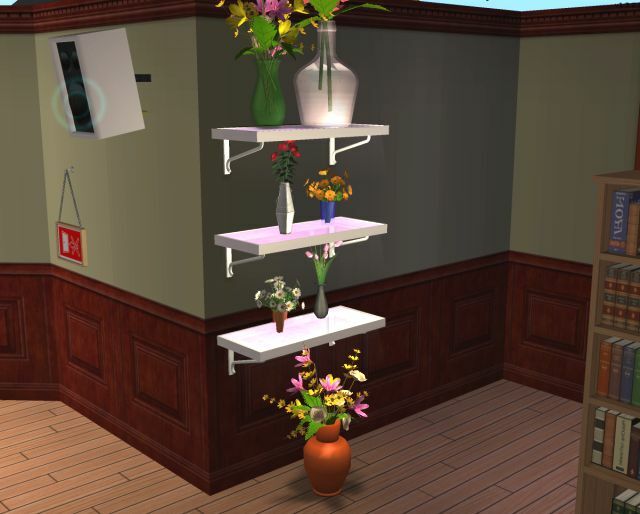 The Multi-shelf can host Maxis and custom objects: there is no difference (no hack needed). Poly Count - In its full configuration (3 shelves): 1550 Verts / 1928 Faces. 8 more Illumutation lighted shelf recolors! These recolours may or may not be endorsed by Numenor. 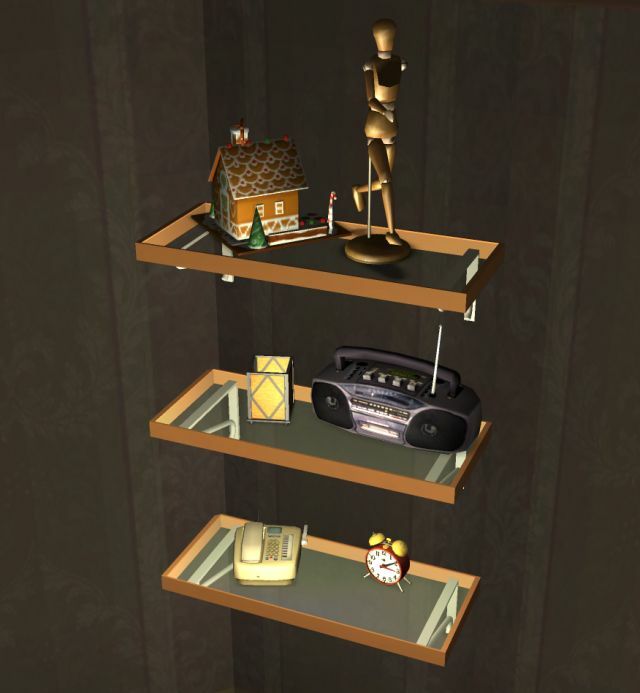 Maxis "Lost & Found" #23: Souvenir Cabinet - *FIXED 18JUNE* - REDOWNLOAD! Fully animated multi-purpose Coal Stove - *UPDATED 21feb06* - REDOWNLOAD!